It&apos;s World Kindness Day today. Yes, it&apos;s kind of a made-up holiday. But really, it&apos;s not a bad idea to celebrate kind words and deeds. To learn more about the impact kindness can have, I interviewed Kennedy Odede. 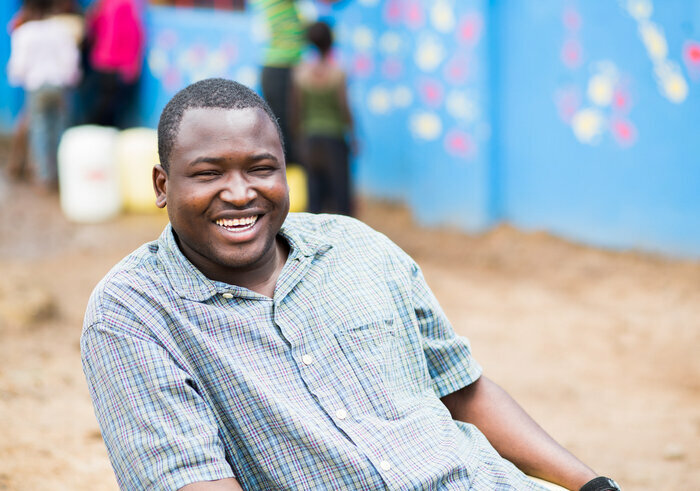 When he was a child living on the streets of a Kenyan slum, the kindness of strangers saved his life. Now 30, he has forged a life based on kindness by starting Shining Hope for Communities, which brings schools and other services to poor neighborhoods in his home country. Awards and honors have come his way, and he&apos;s the author of a new book: Find Me Unafraid: Love, Loss, and Hope in an African Slum. This interview has been edited with a kind eye for clarity and length. Did you know that World Kindness Day is Nov. 13? Wow. No. is it something new? According to the Internet, it was invented in 1998 by some nonprofit groups seeking to promote kindness. And I&apos;m told you know a lot about kindness from your own life, when you spent three years on the streets of the Kenyan slum of Kibera. Yeah, yeah, I was a street boy at the age of 10. How did you get to be a street boy? My parents were very poor and we have violence in the house [from his stepfather]. It was very tough growing up so I ran away. What was it like living on the streets? Being a street boy you feel unwanted. I survived eating garbage. And I saw two things: How people could be kind and sometimes can be mean. Some people would come and offer me food once in a while. But we never trusted people because we never know who&apos;s gonna be kind, who&apos;s not gonna be kind. What did it mean when people were kind to you? What I&apos;ve learned is this idea: How a simple kindness can save a life. I stole one mango — it was food for, like, two days. But I was beaten by a group of people. It was a mob justice. And I thought I was going to die. But one kind person who was walking by said, "Why are you beating this kid?" And they said, "He&apos;s a thief." The person paid for the mango. Without that person, I&apos;m sure I could have been dead. Who was this kind person? It was a middle-aged man. He saved me from the people who were beating me. I&apos;m sure the guy has forgotten. Clearly you haven&apos;t. How has that incident helped shape your definition of kindness? Every time I do something good for kids or for anybody, I think of that moment. Kindness is when you don&apos;t expect this person you helped to give back in any way. I promise you the kindness you are doing has an impact on that person, and that person will continue spreading kindness. How did you get off the streets? I was helped by another kind person, who was a Catholic priest. I really missed school, I was teaching myself how to read and write. And this preacher passed by and he showed me some kind of kindness. He used to smile and that made me really happy. How did you react to him? I used to imitate his accent by holding my nose and say, like a Western person, &apos;How are you, how are you." So you held your nose to get that nasal Western tone? And he was a white man? Yes. And he helped me to go to a local school. So in my life I have suffered a lot but at the same time have seen kindness. Do you follow his example of giving a smile to folks you see? If I go in an elevator, I will smile at people. Do people sometimes look at you as if you&apos;re crazy? Yes, sometimes that is what you get. Doing good doesn&apos;t mean you&apos;re going to get good things. You&apos;re going to get some negative things. If people are unkind it is because of their background — they have been beaten, people did evil things to them. But along the way being kind is better than being unkind. It is a win-win situation. Just be kind. I was curious how you got the name Kennedy. Were you named after John Kennedy? I was named after JFKennedy. I was born a breech baby. My legs came out first. Because I survived, it means I was a leader, so I had to get a leadership name.